February 5, 2018 marks the 25th anniversary of the Family and Medical Leave Act (FMLA), which allows eligible employees to take up to 12 weeks of unpaid, job-protected leave within a calendar year for a serious health condition, the birth of a child or to care for a newly born, adopted, or foster child, or to care for an immediate family member with a serious health condition. While it’s important to celebrate this important milestone, stopping there on the national level has been a huge mistake. Because eligibility is limited based on size of firm, work hours, and tenure at job, the FMLA only provides access to an estimated 56 percent of the workforce. But the largest loophole in the FMLA is that it is unpaid, so many workers who would want to take advantage of it to care for themselves or a family member, simply cannot afford to. Only 13 percent of private-sector workers have access to any paid family leave, which means that 87 percent do not. Due to this widespread lack of paid family leave, workers have to make difficult choices between their careers and their caregiving responsibilities precisely when they need their paychecks the most, such as following the birth of a child or when they or a loved one falls ill. This lack of choice can often lead workers to not take any leave or cut their leave short; about 45 percent of FMLA-eligible workers did not take leave because they could not afford unpaid leave and among workers who took time off for caregiving responsibilities, about one-third of leave-takers cut their time off short due to cover lost wages. The distribution of workers with paid family leave is skewed toward higher-wage workers. As shown in the figure below, workers in the top 10 percent of the wage distribution are six times more likely to have paid family and medical leave to care for themselves or a family member when coping with a serious health condition or to care for a new child in their family than workers in the bottom 10 percent. 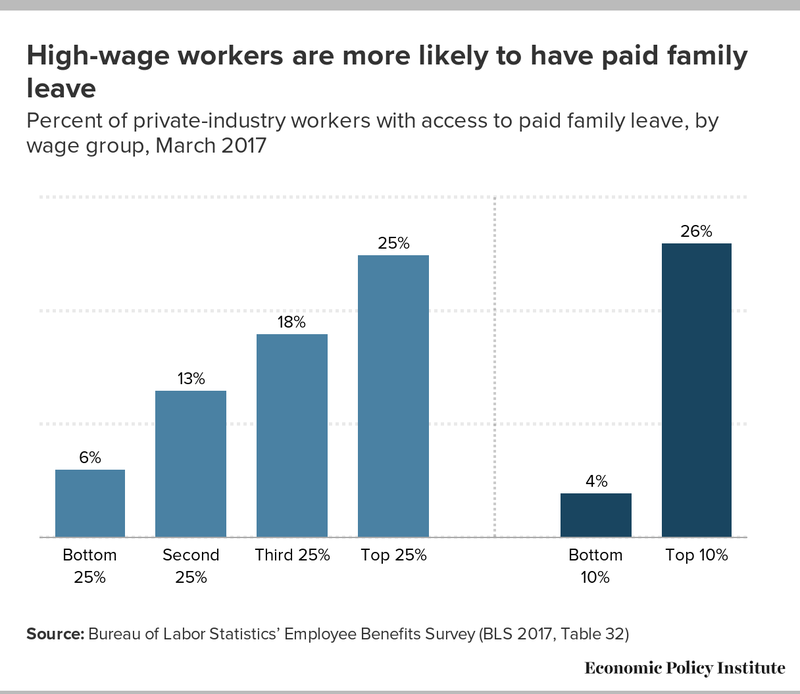 This bears repeating: only 4 percent of the lowest-wage workers have access to paid family leave. The disparities are stark, but even among the highest paid workers, only about one-fourth have paid family leave. Because there is currently no national standard regarding paid family leave, each worker is left to the whims of individual company policies, which often means no paid family or medical leave at all. Fortunately, some states have taken up the mantle and passed legislation to allow workers to earn paid family and medical leave. California (2002), New Jersey (2008), and Rhode Island (2013) were the first. New York’s paid family leave law took effect in January 2018 and Washington, DC and the state of Washington will have protections in effect in the next two years. National paid family leave policy can level disparities between wage levels, be more inclusive of all workers, regardless of firm size, work hours, or tenure, and include workers across the country.